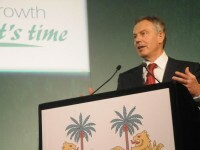 Last week saw Tony Blair, in his role as Patron of the Africa Governance Initiative, present his vision for a new focus on governance in Africa with an event at the Centre for Global Development in Washington, where he launched his essay, “Not Just Aid: Making Government Work Can Transform Africa’’. The speech, (available to watch online), was followed by a Q&A with CGD President Nancy Birdsall. His presentation focused on his thesis that supporting good governance on the continent would lead to millions being lifted out of poverty, with African countries leading global economic growth in the next fifty years. Drawing on the work of the Africa Governance Initiative in Rwanda, Sierra Leone and Liberia, as well as this time as Prime Minister, he draws out lessons that he believes the development community needs to embrace to support country leadership to achieve this goal. He goes on to described how progress can be hampered by the development sector’s emphasis on only pursuing interventions that deliver measurable results, with organisations often rejecting a focus on leadership as, ‘risky and hard to measure’. Throughout , Blair makes the case that that a lack of effective leadership cannot be explained solely by a lack of strategic vision, or of financial resources, but rather it is the lack of ‘the capacity to bring the two together’ that compromises effective governance. He highlights initiatives such as The Government of Rwanda’s Strategic Capacity Building Initiative, which coordinates donor resources in tackling government identified capacity needs that are restricting progress in achieving national policy priorities. In a positive view for the future, Blair’s essay notes the work currently being done to support leaderships free from corruption, arguing that equivalent work needs to go into ensuring that these leaders are able to govern effectively, concluding that, ‘good leadership is about capacity, not just character’.